Warrington-based Learning Heroes is targeting US expansion after signing new partnership deals with three e-learning businesses. Learning Heroes already has a presence in the North American market through its partnership strategy, as well as having multinational clients including Ford, KFC, Virgin and Kellogg’s. But the latest deals with TalentLMS, Docebo and Education Blackbaud will take this up another level. 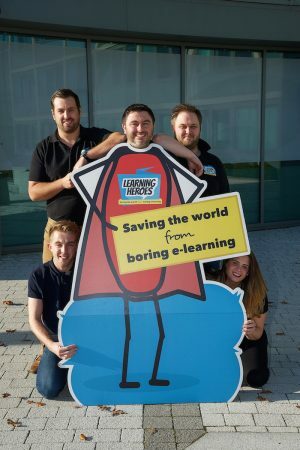 Learning Heroes aims to “save the world from boring e-learning” and produces snappy content including animated videos that can be accessed from any device and location. CEO Adam Kara said: “We set out to save the world from boring e-learning by offering shorter, sharper content more suited to today’s needs, and a simpler, subscription-based pricing model. We didn’t realise we had created a new model until someone compared us to Netflix. “Call it disruption but in truth, all we are doing is producing courses which we would enjoy ourselves and treating customers how we would like to be treated. “The most important thing is that customers love it, as the growth of the company shows. “We’ve had an overwhelming positive response from distributors, companies and end-users to our approach. E-learning is ripe for change on both sides of the Atlantic and we want to be leading the transformation of the industry in Europe and North America. Learning Heroes offers subscribers 180 modules and more than a 1,500 blended learning courses in its content library. New courses are added on a weekly basis, depending on customer suggestions, and come at no extra cost. The firm was established in 2015 and now has more than 300 businesses subscribers in the UK, US and Australia.